As it is Thanksgiving Day in the U.S. I thought it befitting to share with you a review of a book by an author that I am truly thankful for having met. K. B. Hoyle was one of the first authors to contact me for a review when I started blogging at the beginning of the year. She had a superb pitch. I don't know if she had been reading my blog, but her email came shortly after a post where I mentioned that I was thinking of reading the Chronicles of Narnia since I was falling in love with the movies (Prince Caspian in The Dawn Treader may have something to do with that). Anyways, she said The Gateway Chronicles were Harry Potter meets Chronicles of Narnia. If you read my reviews of The Six or The Oracle (or any of the other half a dozen mentions I have made of them over the year) then you know she was spot on. Though I've never read the Chronicles of Narnia series I can definitely see the influence they have on K. B. Hoyle's writing. Not am only thankful that K. B. Hoyle introduced me to a wonderful young adult story, but she has accomplished something no other book has been able to do: The Gateway Chronicles has made my 9 year old niece finally excited about books and wanting to read. Coming from a family where reading has always been important, I cannot express how grateful I am to finally be able to share the love of books with my niece. 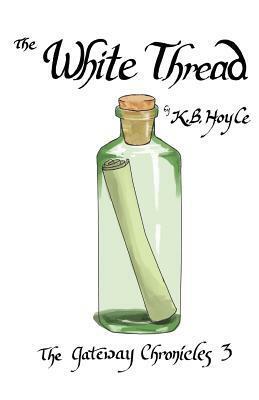 Alright, enough gushing, now on to what I thought of the latest installment: The White Thread. Though not as action packed from the get go as the other two books in the series, there is definitely blood pumping action from the middle on. I was left with the impression that this book was about setting out the puzzles pieces of the series and leaving the reader to piece them together without the picture on the lid. I kind of wished I had re-read The Six and The Oracle before reading The White Thread. I also need more people I know reading this series as I am left with some big questions at the end that I need to discuss with people. K. B. has offered to answer my questions, if it wouldn't ruin the plot (she's so sweet). But the questions I'm left with I don't really want to know the answer to until they are revealed in the other books. At the same time they would be fun to discuss with people. My questions are on the order of "Is Snape really evil?" or "What if Harry hadn't disarmed Draco and became the rightful owner of the elder wand?" (I'm having a Harry Potter movie marathon this week, can you tell? Also Harry Potter was the last series where I had a burning desire to discuss it with everyone I met, much like I'm having with The Gateway Chronicles). Seriously, please go read these books! I want to see if any else thinks there's a connection between the Oracle and the guy who made the gateways. Plus, I wonder if their clothes changed back when they were ripped from Alitheia. Was Perry's sword just left hanging mid-swing? I don't know if I can wait until 2012 to find out what happens next. Please help assuage my curiosity by joining in on the speculation with me. So go pick up this series NOW, read it, then come back and discuss it with me! 2/28/2012 Update: The Gateway Chronicles has been picked up by Australia based independent publisher The Writer's Coffee Shop. The will re-release the first three books in the series this year, starting with The Six on April 5. Okay, I bought The Six. Can't wait to find time to read it, I love HP and Narnia. Yay! I really hope you enjoy it. I love the series. Please come back and tell me what you thought. I like you wish I had read the first two books again before reading the White Thread. I found it hard to keep the non-main characters straight. I had trouble remembering what they were known for and how they related to the main characters. I would have found a character review very helpful. It might be something worth including in the upcoming stories. Thoughts? Anon - When I was doing the review, I had looked for a character glossary of sorts on K. B. 's site because I had trouble remembering on the characters names. When I couldn't find it, I suggested it her. A quick pick at her blog On Alitheia shows that she is starting a series of character posts.